This ornament has it all! 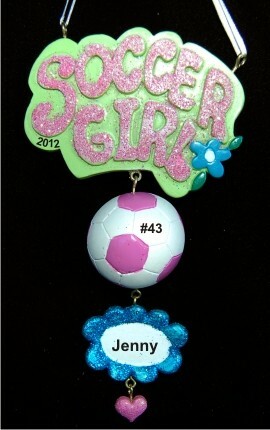 The cool girls rock at soccer personalized Christmas ornament dazzles with brilliantly glittered colors while showing off a love for the greatest game on grass. It's one of our sports ornaments personalized for the recipient, so give us her details and we'll add them by hand in an attractive font. The cool girls rock at soccer Christmas ornament personalized for her will be a thrill when she finds it in our plush and pretty velvet pouch, a Russell Rhodes exclusive.